Hey Amadea | Enjoy the little things: Summer Haul! I feel like Bath&Body Works is always on sale. Am I right? Their body care products were all on 'buy 3 get 3' sale. These are all for me..
and these are for my boyfriend. He picked them up himself. Quite surprising actually because he typically doesn't care for this kind of thing. These mini candles were 2 for $5. I originally wanted to pick up the huge one for $19.50, but then I thought I can get 4 or even 6 mini candles with the same amount of candles. Plus, I get to put the candles everywhere, which I wouldn't be able to do with only one giant candle. The hand soaps were $3 each. My boyfriend likes the Sea Island Cotton one, and I liked the Sweet Pea. I now have the shower gel, body lotion and hand soap in Sweet Pea. Do you wear matching shower gel and body lotion? I was really excited when this cute iPhone case finally came in the mail. It was supposed to arrive long time ago, but for some reason I didn't get the package in the mail even thought the tracking ID said otherwise. I really thought someone took it, but whatevs. I contacted the seller on ebay and he agreed to send me another one. How nice! I love the colors. I also love the melting-look-alike texture. It reminds me of ice cream kind of. I ran out of my Tresemme heat protector, so I bought the Joh Frieda Frizz-Ease Protective Styling Spray. It smells good, and I think, based on abundant reviews, it gets the job done. Protecting your hair from the heat is extremely important. Trust me. I learned the hard way. I used to think that back in the day people didn't need heat protector, so why use it now? I was wrong. Just because we don't have it doesn't mean we don't need it. I've got major split ends for as long as I can remember. My hair is extremely dry and damaged, but it's getting better now. The Tresemme Split Remedy Leave-in conditioner does its job really well. The other day after I curled my hair, I noticed how dry and tangled my hair was. I pumped a pea-size amount of the conditioner and just lather it on my hair, and it gives an instant moisture. Tangle no more! It also makes your hair look shinier and healthier. Another lip products for me. I think I'm kinda a lip junkie. My mom gave me the Elizabeth Arden one. I've never thought of the brand before. I've heard of it but never really try anything from the brand. I love jumbo lip pencils like the Revlon Balm Stain. It gives you a lot of control, and it's just fun to apply on your lips. But the Lovesick is not really right for me though. It's fun for tutorial and all, but I'm not typically comfortable wearing such bright color on my lips. It might grow on me though someday. I've heard emilynoel83 raved so much about Revlon Super Lustrous lipgloss, so I went ahead to pick up one and try for myself. I like it so far. It's shimmery, glossy but not sticky at all. I've been told that sticky lip glosses help them stick longer on your lips, but I just don't like them. My mom bought One lip balms for her friends as souvenirs. I've never tried one before. She told me that products containing shea butter are usually really hydrating and moisturizing, so she picked one up for me too. Forever 21 floral short shorts. Love 'em! Van Heusen Colorful Plaid Scarf. It was on sale from $45 to $15. Wow! Have you ever heard about the Pandora bracelets? I've never heard of it until my mom bought me this bracelet. We were on Harrah's hotel at South Lake Tahoe, and there was a jewel store selling this bracelet. It was supposed to be a dupe for the Pandora bracelet. The original one is really expensive, you have to purchase each charm for at least $20 each. You get this entire bracelet for the same price. 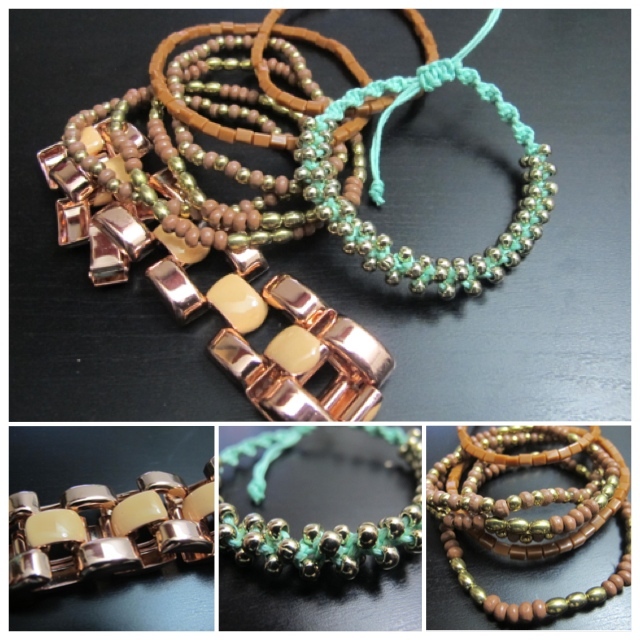 If you haven't known already, I love bracelets. I picked these from H&M and the the mint green one is from Forever 21. 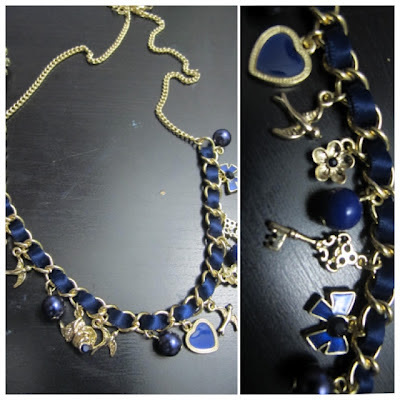 This navy necklace is from Old Navy. I never knew Old Navy sold any jewelries. 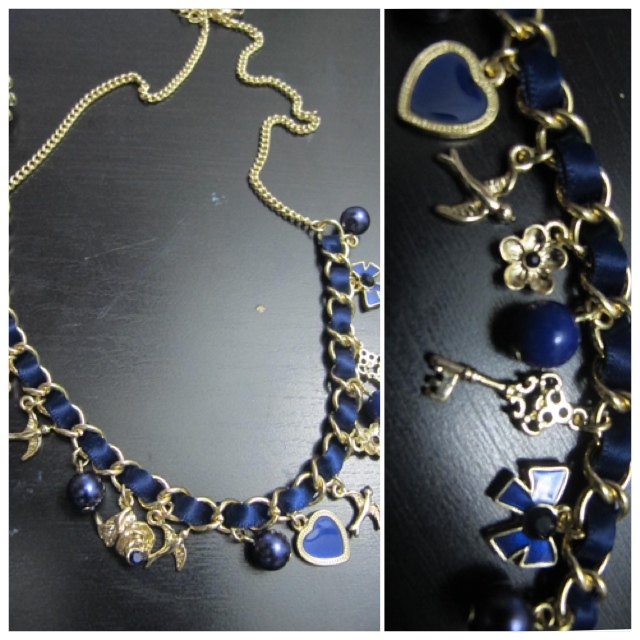 I loved this particular one because of the color and the various charms around it. I wore this on the 4th of July, which by the way, I spent with watching movies and fireworks! How's your 4th of July?